When I announced that no one could use the word retired or in pensione around me – I was in my second act – ask how the second act is going – a few eyebrows were raised and I heard a few snickers. I love this second act idea – it is perfect for me since the characters in my life – personaggi – are straight out of the Comedia dell arte. Stock characters who keep me on my toes and improvising. In small towns like the one I grew up in, Flagtown, NJ, and the one I live in now, Pontelandolfo (BN), if you fall down some one is there to pick you up. If you think about getting married 42 people call you to talk you into or out of it. No monologues allowed – shove that soliloquy. Acting is reacting and in small towns you react a lot. May 14th was my birthday – il mio compleanno! Sixty-seven years older and bolder. That morning, the cast of characters that often upstage me riffed off the birthday theme, forcing me out of the Diva role into the role of the straight man. When I came down the stairs my dining room was draped with crepe paper chains. The ever creative Nichola had dressed the set! Besides the crepe paper chains, the living room and dining room were festooned with flowers. Fit for a Diva’s Dressing Room! Quick a line – questo è un funebre? No, Midge tu non sei morta – solo vecchia! Ouch, what a quick comeback – I’m not dead only old – gulp. The three dozen plus roses and buckets of flowers were the set decorations for la festa! 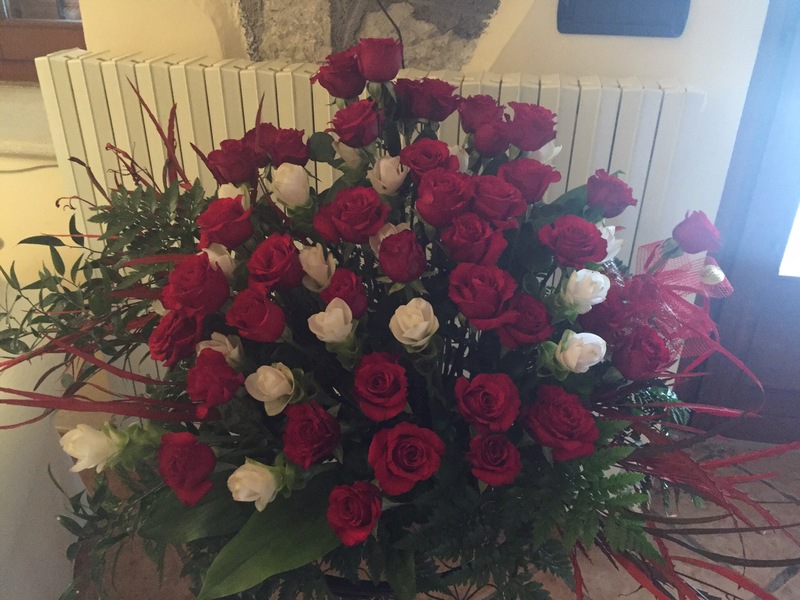 Thank you Janet for sending a bouquet across the sea – how do they stay alive during that 8 hour flight? Thank you Nella, Fabio,Cosimo and Michele for the hot colors. Thank you Zia Vitoria for the wine and cheese. And thank you Nicola for scurrying around with Jack and dressing the set, long before the Diva took the eye pads off and stared at her gorgeous morning face in the mirror. No BORING dinner party for me. Or worse cocktails and idle chatter. No, at 9:30 AM the supporting cast arrived for La Festa delle Sfogliatelle. I am another year bolder!! It is my birthday and I can eat what I want to! I could also have my handsome houseman – Jack – ply the guests with peach bellinis. After four of them I stopped looking for my light – where ever I was the light was shining. Then I noticed that the supporting cast had more lines than I did. Did they forget – I am the star of this here show? Remember acting is reacting, it was time for them to stop reacting to me and for me to do a little reacting myself. Your heart is young and gentle. Your blood is Italian – my blood is the same. We are Guerreras – all strong women. Live life now and happily. Go with love. One tear rolls down my face. Previous postScarola! Cardio! Cicoria! Yummy! Next postCooking in the Kitchens of Pontelandolfo a HIT!!!! Bello, Midge! What a great bday. This “second act” in Pontelandolfo is truly a blessing. Thank you! I paid the price the next day!! Those pastries look wonderful and make me miss the Italian bakeries in Hoboken. Make every day a new act! Or at least a new scene! What a gorgeous birthday tribute, Midgie! I’m so impressed….You’re not merely bi-coastal. You’re bi-continental! I hope your 67th year continues to blossom and bloom! It is a small world and I’m glad we get to play in it! Happy BIrthday. 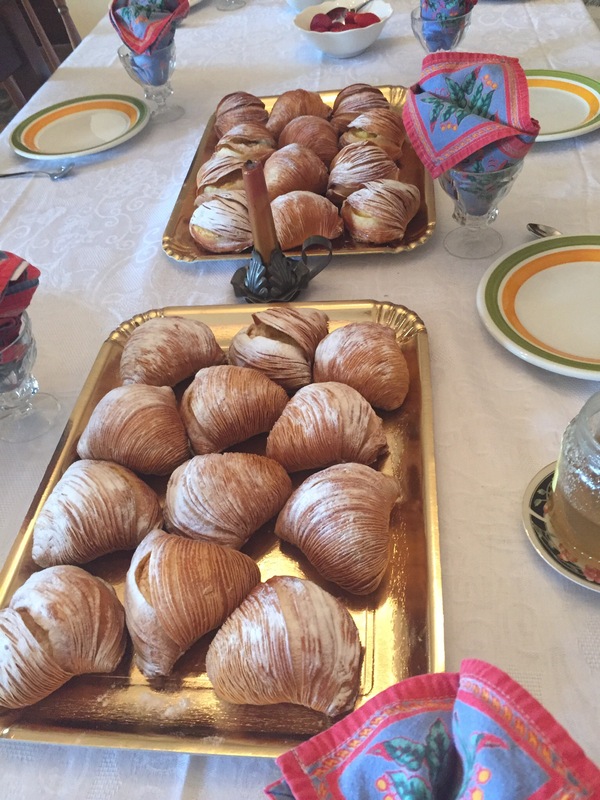 I love Sfogliatelle! I hope you know that all of us in the USA are insanely jealous of your Italian excursions. So don’t worry about being vecchia-enjoy it. We need to learn how to make sfogliatelle!! Thanks for reading my little tales. Happy birthday your day sounded simply perfect…..you are truly blessed to be living la dolce vita…. Thank you! Some days are sweeter than others! Pensato intermezzo e piu bene, no il atto secondo. O dopo tutto intervallo ed prima la finale.